We try to honor special requests if check-in or check-out needs to be adjusted. 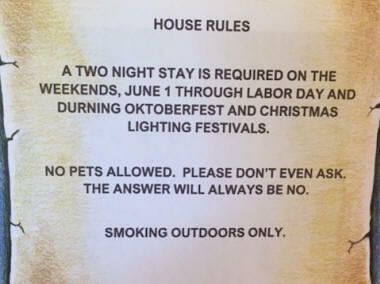 No pets allowed, smoking outdoors only. Our suites are designed as a two person occupancy, The suite can accommodate a third person. There is an additional fee of $15.00 for the third person if over the age of three years old. Cancellation Policy: We require two week’s notice of cancellation for Oktoberfest & Christmas Lighting reservations. Otherwise, one week is required. Bad weather is only accepted as a short notice cancellation (24-48 hrs) when Stevens, Snoqualmie and Blewett Passes are closed. We offer a one night free with a one week stay. Contact the owner for availability. or complete the form below and will will do our best to get back to you as soon as possible. Note: This is brand new suite!! "Our stay was lovely in every way. Where to begin... large room, VERY comfortable bed, extra pillows. No chemical or "old" smells. Nice extras like a little candy to munch. Electric fireplace for ambiance and a little extra heat if needed. Nice "common kitchenette area" with refrig, micro, sink, dishes. The "continental breakfast" was wonderful and had yogurt and eggs for protein option. 100% real juice options, fresh pastry, endless coffee.. I am sure I forgot some things. Relaxed, quite setting. Easy to find..no hilly road that would be easy even with snow. Will probably return and rent both suites for family vacation. No steps to enter so good for older folks also."